1) All kinds of changes afoot in Oakland’s Jack London Square, which looks primed for a revitalization. For starters: Yesterday was opening day for The Forge (66 Franklin St.), the ambitious new pizza-and-beer spot on the waterfront. In addition to a behemoth of an 800-degree imported Italian pizza oven, the restaurant boasts the combined culinary firepower of three Jeffs: head chef Jeffrey Amber (formerly of Moose’s and XYZ in San Francisco), Jeff Krupman (the legendary “Pizza Hacker”), and Jeff Hayden (who slung pizza at Dopo and Boot and Shoe Service). Amber told Grub Street the idea was to create an “American pizzeria without falling into the Italian thing.” Thus, instead of pasta, non-pizza offerings include things like fried pickles and chicken pot pie. Check out the full menu, as well as Grub Street’s slideshow of pretty photos from a recent preview dinner — the fire pits on the outdoor patio are especially striking. A pop-up event at North Berkeley’s Guerilla Cafe (1620 Shattuck Ave.) last Friday gave diners a taste of the homey, Southern-inflected cooking of Romney Steele, whose oyster-centric restaurant, The Cook and Her Farmer, is slated to open in Old Oakland’s Swan Marketplace later this year. 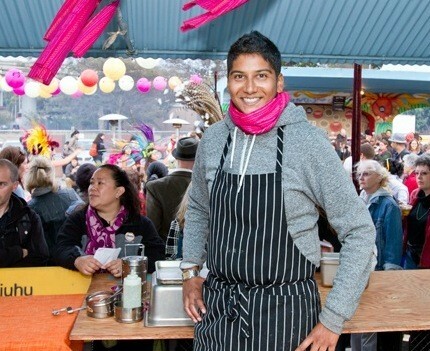 To the abundance of feathers in Oakland’s culinary cap, let’s add one more: our very own Top Chef alum, Preeti Mistry, who, as previously reported, has found a brick-and-mortar home for her popular Indian street food pop-up, Juhu Beach Club, in Temescal, at 5179 Telegraph Avenue (the former SR24 location). Mistry said she’d been full-speed-ahead on plans to open in San Francisco’s Mission district when she and her then-business partner parted ways. At that point, she’d been living in Oakland for about a year and had watched amazing restaurant after amazing restaurant sprout up on this side of the bay. “It seemed like the obvious choice was to open here,” she said. 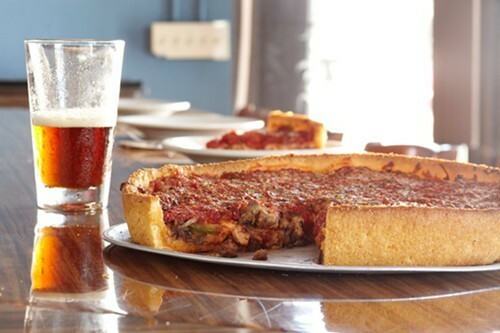 1) Grub Street brings this bit of exciting news: Little Star Pizza’s delicious deep dish pizza will soon be coming to Oakland — specifically to a suddenly-hoppin’ stretch of Grand Avenue that is already home to Boot and Shoe Service, Camino, Destino, and the recently-reviewed Grand Lake Kitchen. The restaurant will replace the recently-shuttered Milano (3425 Grand Ave.) and will be called The Star — as Inside Scoop noted, Little Star co-founders Brian Sadigursky and Jon Guhl have divvied up their expansion plans and aren’t using the trademarked Little Star name for any of their new restaurants. In his interview with Inside Scoop, Guhl, the proprietor of The Star, said the Grand Ave. spot would have slight menu from the original Little Star locations. For me, the takeaway is simple: Now I won’t have to trek all the way to Albany for truly excellent deep dish, and takeout becomes a viable option for the first time. Every morning, Sheila Young-Eberhart arrives at the 18,000-square-foot manufacturing facility for Richmond’s Rubicon Bakery, punches the clock, and gets to work. She’s the bakery’s quality assurance manager: one of the last lines of defense in making sure every cupcake, marshmallow, bite-size brownie leaves looking and tasting the way it’s supposed to. By all accounts, she is a model employee. But before Young-Eberhart started her entry-level job in Rubicon’s packaging department four years ago, she was a drug addict who’d just completed a four-month stint in jail. She wanted to turn her life around but had few realistic employment prospects. Sheila Young-Eberhart credits Rubicon Bakery with helping her turn her life around. Rubicon Bakery hired her because that’s what it does: Almost all of the company’s 85 full-time employees are ex-cons, recovering drug addicts, and the recently homeless. 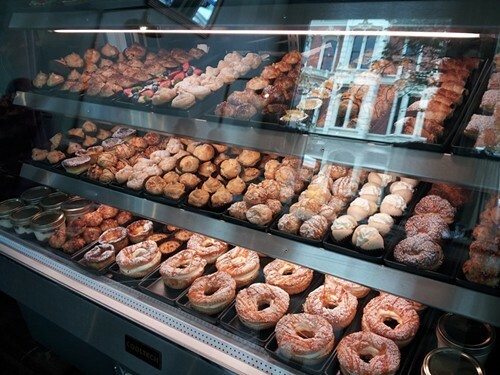 Many of them are funneled in through the job-training services offered by Rubicon Programs, the Richmond-based nonprofit that founded the bakery in 1993. It is a company that has staked its entire business model on the idea that people deserve a second chance. Anfilo Coffee (35 Grand Avenue), the new Uptown Oakland brick-and-mortar coffee shop whose Grand Lake Farmers’ Market stall (then called “Jébeena”) What the Fork highlighted last summer, is finally open, after several months of permitting and construction delays. The husband-and-wife owners, Ambessaw Assegued and Dagmawit Bekele, practice the traditional rituals of Ethiopian coffee culture and hope to bring their unique style of coffee service to a wider customer base. The cafe had its soft opening last Friday, January 18, and hours are tentatively set for 7 a.m. to 9 p.m. daily. A full-on grand opening celebration will coincide with February 1’s First Friday festivities — to mark the occasion, the cafe will have the work of a local photographer, Diallo Mwathi Jeffery, on display. 1) Perhaps it’s too early to declare 2013 the Year of Ramen, but it’s beginning to look that way: It seems like people started waiting in line to get into Rockridge’s Ramen Shop (5812 College Ave., Oakland) months ago, when news first broke about the Chez Panisse pedigreed noodle specialist — it’s now in its second week of business. Here’s another newcomer: Ippo Ramen has been popping up at Linden Street Brewery for several months now. This Sunday, January 20, from 10 a.m. to 4 p.m., chef and proprietor Steven Yee will be doing his first pop-up at CommonWealth Cafe & Pub (2882 Telegraph Ave.). Yee said he fell in love with the noodles during a thorough exploration of the Osaka ramen scene. Cafe V (2056 San Pablo Ave.), a trendy Vietnamese fusion restaurant, opened last summer in a space across the street from Local 123, the popular West Berkeley coffee shop. Yesterday was the first time I noticed the place, and, as it turns out, V just re-opened last week with new management and a new head chef (Yvonne Thi) who used to run Vietnamese restaurants in Concord and Pleasanton. 1) Old Oakland’s trendiest wine bar, District (827 Washington St.), is opening up a takeout counter in the space behind the restaurant’s kitchen, on 9th Street, according to Inside Scoop. The takeout shop will be called District Carriage House, and it’ll be open from 11 a.m. to 1:30 p.m., serving sandwiches and a variety of other takeaway lunch items. No official opening date has been set, but it sounds like it’ll be early this year. Happier times for the pastry case at Borgo Italia. 2) A reader wrote in with this bit of bad news: For the past several weeks, the much-ballyhooed pastry case at Borgo Italia (499 9th St.) has been completely empty. Co-owner Fabio Dalla Vache confirmed that his partner Franco Camboli, Borgo’s dessert guru, has had to be away from the restaurant for the time being due to a personal matter. But one way or another, Dalla Vache expects that Borgo Italia will get its dessert program up and running again in about a month or so. Stay tuned. Bargain hunters and appreciators of prix-fixe dining, take note: This month, Oakland and Berkeley are hosting their very own Restaurant Week. In other words, your favorite dining establishment — or maybe that new place you keep meaning to check out — might be one of a few dozen restaurants that will offer special two- or three-course set menus, priced at a slight (or, occasionally, a significant) discount, during the promotional period. First up is Berkeley, whose very first Restaurant Week kicks off this Sunday, January 13, and will run for the whole week, through January 20. Meanwhile, Oakland’s week-and-a-half-long Restaurant Week will run from January 18 to 27.